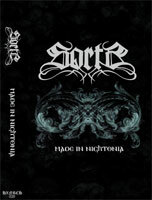 Description: Sorts was kicked off more as a project than a fullblooded band in 1998 by Gates, a member of the first Estonian black metal act - The Grey Calamity. Later, Gates became known as, now already a former, guitar player of Loits and Manatark. After writing some tracks, Sorts formed a live group that, over the years, consisted of numerous members from Estonian black metal scene's core bands like Tharaphita, Manatark, Loits, Must Missa, Urt, Realm of Carnivora, etc. Regrettably due to lack of time the band never had a chance to step on stage. Sorts managed to launch a cd single named "Demons on the Ride" in 2000. The same track was also included in the compilation "Estnische Kriegskameraden" in 2004. In the end of 2008 Sorts gathered again in full cast with an ambitious plan to make a striking comeback. The band consists of four original members: Ank (Tharaphita, Must Missa), Mantas (ex-Loits), Thon (Urt, S�jaruun) and Gates.